It's been getting extremely chilly outside the past few weeks. I really can't complain too much since it hasn't been raining and the sun has been making regular appearances on a daily basis. Not to mention that the disaster-inducing winds have finally (!!) died down, so rather than the -15°C temperatures we've been experiencing it's now a warmer -10°. You'd think after growing up in the interiors of BC that I would be used to copious amounts of snow and bone freezing weather, but after spending the last 10 years living on the West Coast my body and mind has become accustomed to the lack of snow and warmer climate. So it's fair to say that the past few weeks have caused quite the shock to my system and I've been finding myself in major need of thick cozy sweaters to put the chill at bay. That brings me back to my knitting. I was on a wee hiatus there, mainly cause the little one was sick, I was exhausted, and for a while there I couldn't knit a row without falling asleep. 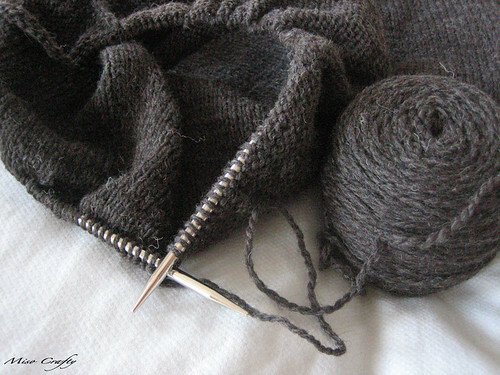 But with the weather getting colder by the hour, I've been finding the need and the motivation to get knitting again. I actually started the Berkshire Doleman sweater back in October, but then it fell to the back burner while I was knitting up a storm of Twilight-related projects. I'm quite proud of myself for not starting another project since (although, the temptation has definitely been there!) and am determined to finish this sweater before the year is over. The beauty of this project is the sleeves...or should I say, the lack of? The sweater has dolman sleeves that are knitted as part of the back and front. Yay! No separate sleeves to knit up! How wonderful is that? Although, the one teeny, tiny thing that bothers me about this sweater is the name. I wonder if the spelling of "Doleman" in the title of the pattern was a misprint/mistake and then was left there for the sake of it? Since the actual sleeve itself is "dolman". I know, I know, it's nothing major, but it still drives me crazy! Anyways, I've already finished up the back and am 3/4 of the way done the front. I would've been done sooner had I paid attention to the "at the same time" remark in the pattern, rather than continuing on "as for the back piece". Oh well. At least this was the first time I had to rip anything back in this project. I'm just happy that once I get the front finished I can block this bad boy, sew it up, and then continue knitting the cowl and the sleeve cuffs. Then finito! So far the pattern has been easy to read and follow, and I've really enjoyed working with the recommended yarn, which is Cascade Eco Wool. I've never used this yarn before, even though I have 2 more skeins of it in my stash for the Owls sweater I plan on knitting sometime in the new year. The Eco wool has been really easy to work with and I've had no problems with it even after ripping back 10 rows of knitting. The only issue that I've encountered was trying to wind the behemoth skeins into cakes. I don't think there's a yarn winder that can wind an entire skein into one cake! I ended up having to cut halfway through the winding process and make 2 cakes from each skein. I guess this is no longer an issue, now that I've discovered the spit and splice method of joining yarn. Ok, well, I should get back to knitting. I have a few moments to myself before the little one wakes up!